May has claimed austerity is over, but where are the concrete initiatives to back this up? Prime Minister Theresa May has boldly declared an ‘end to austerity’. Sounds good, but where are the government policies to achieve it? Austerity has been the government’s deliberate choice. Wage freezes and cuts to public services were legitimised with the claim that there is an urgent need to reduce public debt. That is not what happened. In August 2010, the UK net debt excluding the temporary effects of financial interventions was £823.3 billion, equivalent to 56.3% of gross domestic product (GDP) and £934.9 billion, equivalent to 64% if financial interventions are included. By August 2018, the public sector net debt, excluding public sector banks, had grown to £1,781.9 billion or 84.3% of GDP. Rather than reducing debt, austerity has been used as a weapon in class wars and to shuffle wealth upwards. The data published by the Office of National Statistics shows that the UK’s wealthiest 10% of households owned 44% of aggregate total wealth. In contrast the least wealthy 50% of the households owned just 9% of total wealth and middle wealth households (51% – 90%) had 44% of wealth. Income and wealth have trickled upwards. Over the last 30 years the share of income going to the top 1% has doubled from 6% to 14%. In 2017, the average income of the richest fifth of households before taxes and benefits was 12 times greater than that of the poorest fifth. Between 2007 and 2015, real wages fell by 10.4%, the joint lowest in OECD countries. The UK savings ratio is almost the lowest since the records began in 1963. 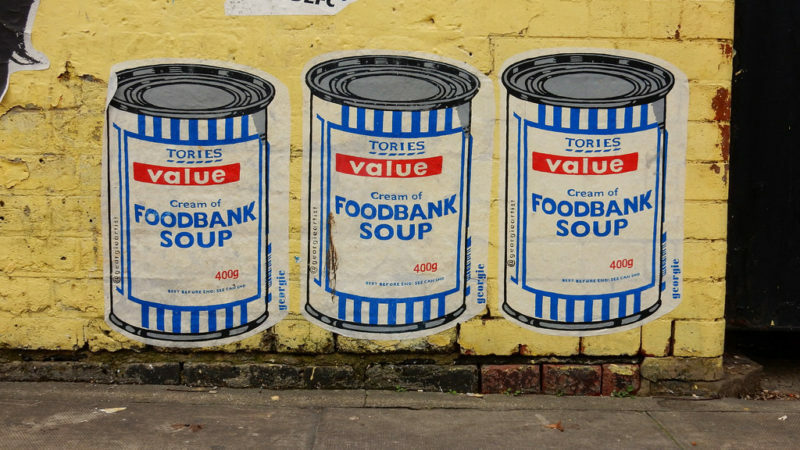 Unsurprisingly, people rely on food banks and loans to make ends meet. Before the 2007-08 crash, household debt stood at £1.45 trillion and is now around £1.59 trillion. The government’s economic strategy is based on the assumption of greater household debt – about £2.3 trillion by 2022. The government has not offered any policies to change the above. Taxes can be used to secure a more equitable distribution of income, but that is not what the government has done. In 2010/11, the basic rate of income tax was 20% and is still the same. At the same time the highest marginal rate of income tax for annual income above £150,000 was 50%, but in 2013 it was reduced to 45%. This has also been accompanied by capital gains tax (CGT) changes which have primarily benefitted the wealthy. Since 2016, the UK has had two separate bands for taxing capital gains and the rate depends on whether the taxable gain is from property and/or non-property assets, and whether the taxpayer pays income tax at the basic rate or at higher and additional rates. In general, gains from property (e.g. second home, buy-to-let investment) are taxed at 18% for basic rate taxpayers and at 28% for higher and additional rate taxpayers. Gains from non-property assets are taxed at 10% for basic rate taxpayers and at 20% for higher and additional rate taxpayers. The differentials in the income tax and CGT rates have created opportunities for the tax avoidance industry to use its energies to convert income to capitals gains, and even vice versa if the circumstances are considered to be advantageous. If wealthy individuals succeed they can pay tax at 20% or 28% rather than at the marginal rate of 45%. The government’s keenness to shunt wealth upwards has been a boon for the tax avoidance industry. The revelations in the Panama Papers, Luxembourg leaks, HSBC Leaks and Paradise papers show that wealthy elites are adept at avoiding taxes. Tax avoidance by elites is also facilitated by the UK’s Crown dependencies and Overseas Territories and there is little effective action and a dearth of test cases. No big accountancy firm has been investigated or prosecuted even after the courts have declared their tax avoidance schemes to be unlawful. The government claims that it has reduced the tax burden on the less well-off by increasing the tax-free personal allowances for income tax purposes. It forgot to mention that since 2010, it has increased VAT rates which hit the income of the less well-off the hardest. The standard VAT rate was 15% in 2009 and increased to 20% in 2011. The net effect of the above policies, as per the data published by the Office for National Statistics, is that the poorest 20% of households pay 29.7% of their income in indirect taxes and 12.7% in direct taxes i.e. 42.4% of their income, compared to the richest 20% paying 14.6% of their income in in indirect and 23.2% in direct taxes i.e. a total of 37.8% of their income. The government has not offered any policies to change the tax burden. Austerity can’t be ended by empty words. The government needs to announce concrete initiatives which will require it to abandon most of the policies that it has pursued since 2010.